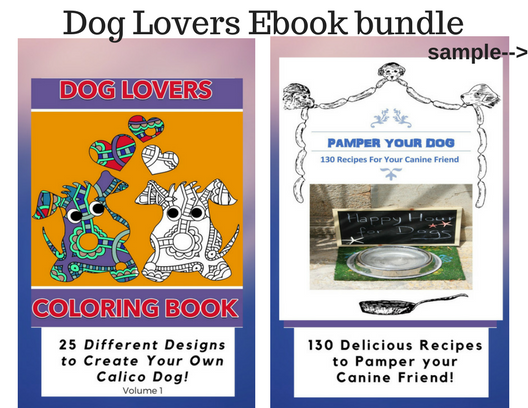 Save $$ by getting and enjoying both the "Dog Lovers Coloring Book" and the "Pamper Your Dog Recipe Book" together! Pamper Your Dog Recipe Book is an ebook with 130 delicious recipes for that special dog in your life. Recipes include such things as: Doggie Biscuits, Cookies, Beef Twists, Bacon bits, Bow Wow Burritos, Bulldog Brownies, Chow Chow Stew, Doggie Quiche, Meatball Mania, Pet Puffs, Trail Dog Grub and many, many more. Dog Lovers Coloring Book contains 25 different beautiful dog patterns for the dog lover in you. Enjoy hours of fun coloring your own calico dogs! Coloring is also a good way to relax and take the stress away. Good for both adults and children to enjoy. ***To see and download a sample of the ebooks, press the blue "Review" button in the upper right corner.